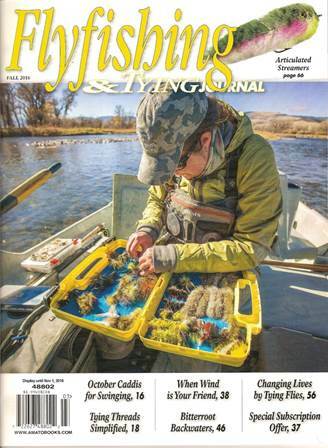 One of my favorite print magazines for fly fishing is the Frank Amato Publications Flyfishing & Tying Journal. It always is a good read with lots of interesting information, articles and fly patterns but I think this issue is a standout. Dave McNeese has an excellent article about Ernie Schwiebert and some of his fly patterns. Ernie was an old friend of mine and this is an excellent article about one of fly fishing's great author and angler. There is an excellent article by Len Waldron about fishing with an old friend, an article on Dapping by Jeff Morgan, articles fishing the Trico hatch by Dave Hughes and October Caddis by Steven Bird. My old friend Paul Schullery does some excellent book reviews and Boots Allen has an excellent article on Fishing the Autumn Lake-Runs. All this an much more. Get it, read it and then go fish.